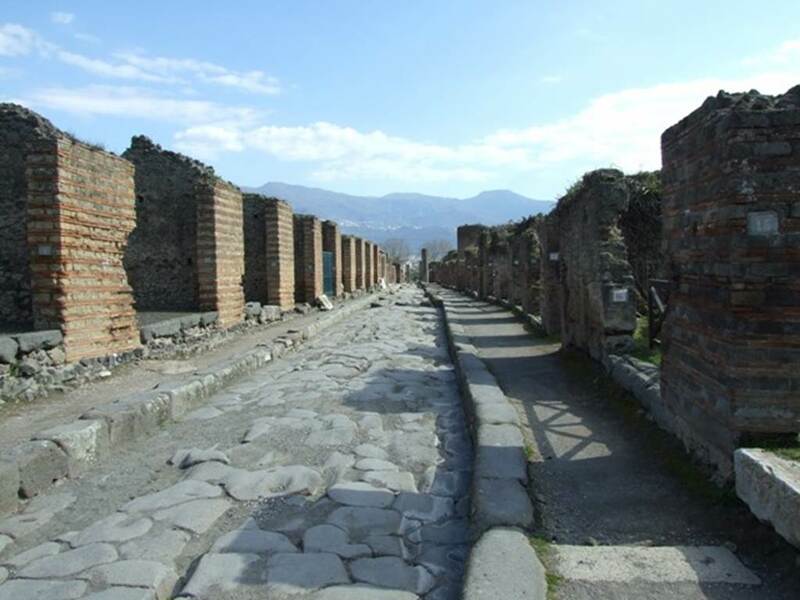 Pompeii Street View. 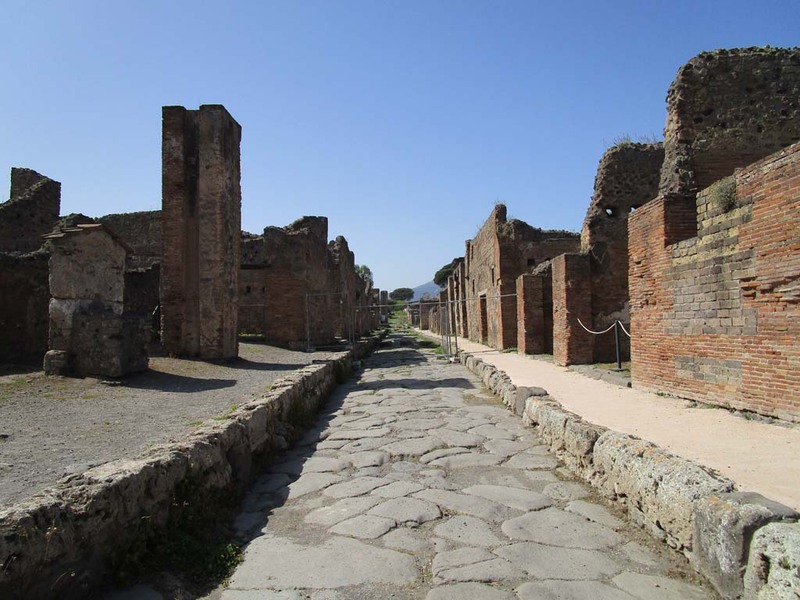 Via del Vesuvio. South to North. Via del Vesuvio, May 2010. Looking north from crossroads with Via della Fortuna, Via di Nola, and Via Stabiana. 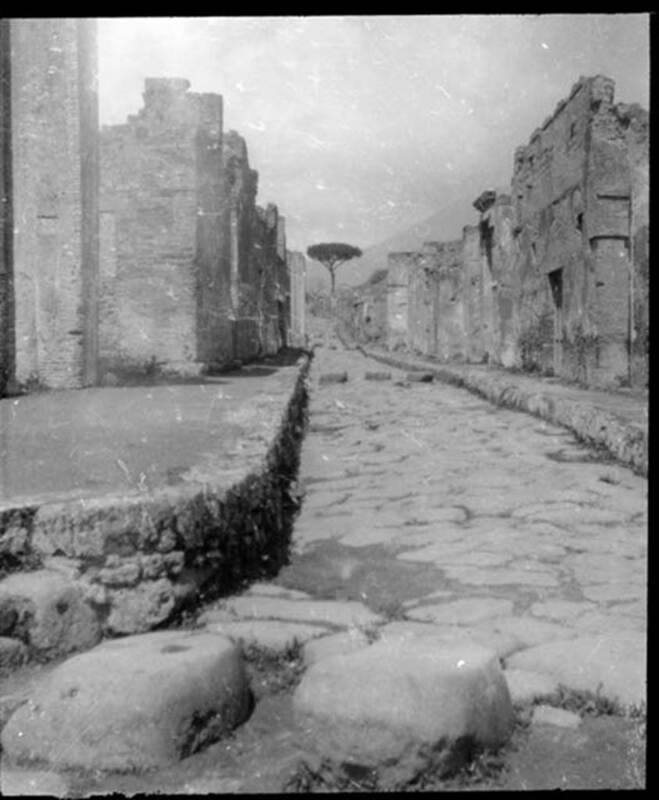 Via del Vesuvio, 1959. Looking north. Photo by Stanley A. Jashemski. Via del Vesuvio, May 2010. Looking north between VI.14 and V.1. 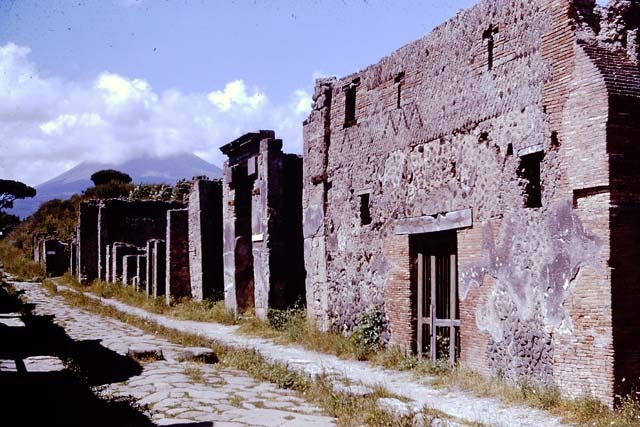 Via del Vesuvio, 1959. 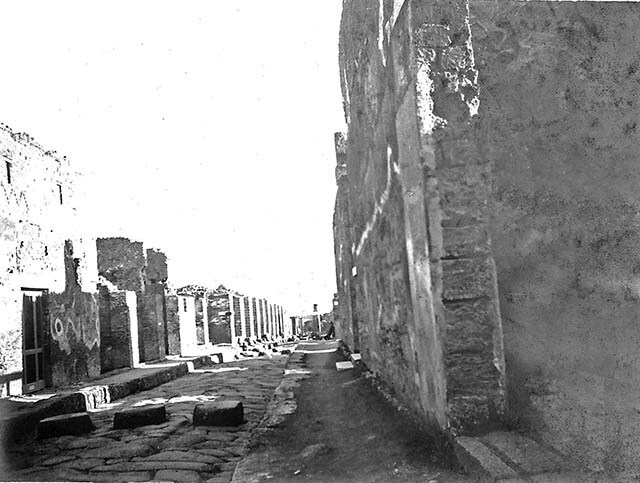 Looking north between VI.14 and V.1. Photo by Stanley A. Jashemski. Via del Vesuvio, May 2010. Looking north-east towards the junction with Via Nola, from Via della Fortuna. Via del Vesuvio, May 2010. Looking west along Via della Fortuna, from the junction with Via del Vesuvio. 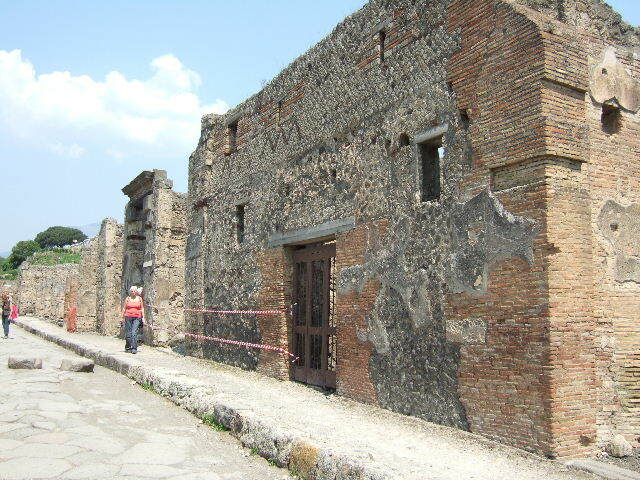 Via del Vesuvio, east side, May 2010. Looking north-west along V.1. Via di Nola between V.1. and IX.9. March 2009. Looking east from Via del Vesuvio. 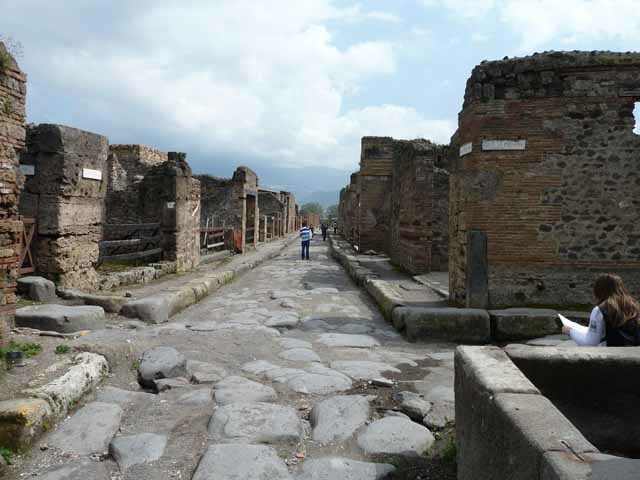 Via del Vesuvio between VI.14 and V.1. March 2009. Looking north from the crossroads. 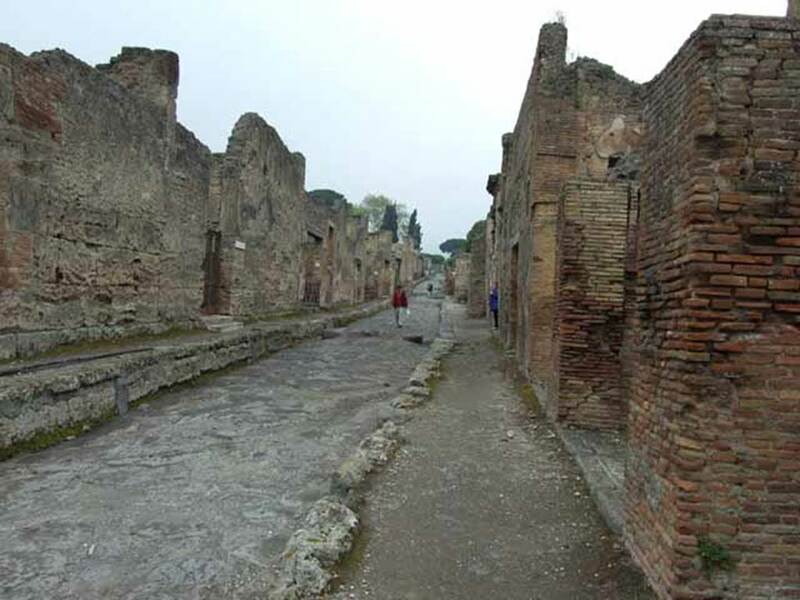 Via del Vesuvio between VI.14 and V.1. Photo by B. M. Blackwood. Looking north from the crossroads with Via della Fortuna and Via Nola. Used with the permission of the Institute of Archaeology, University of Oxford. File name Blackwood001. Resource ID. 24577. 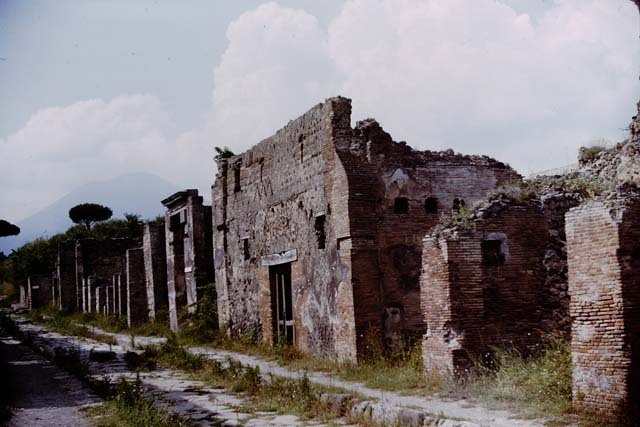 Via del Vesuvio between VI.14 and V.1. 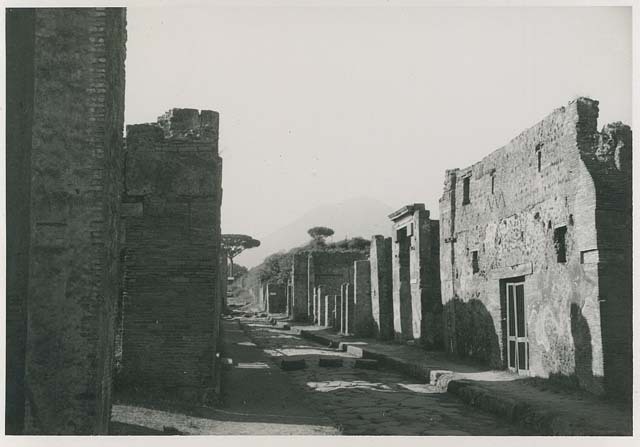 Pompeii, 1933. Looking north. Photo courtesy of Peter Woods. 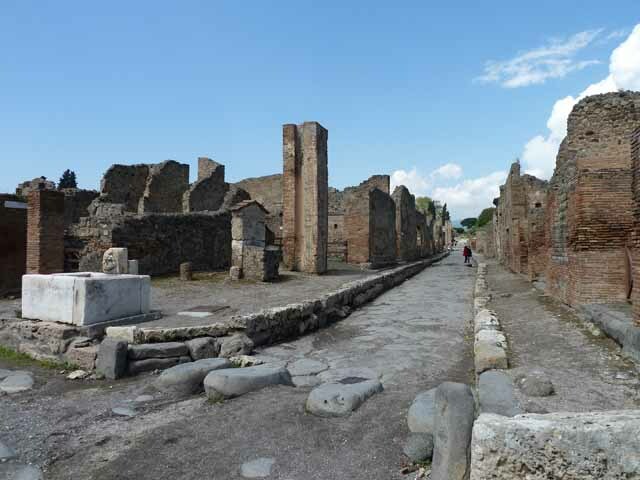 Via del Vesuvio, east side. 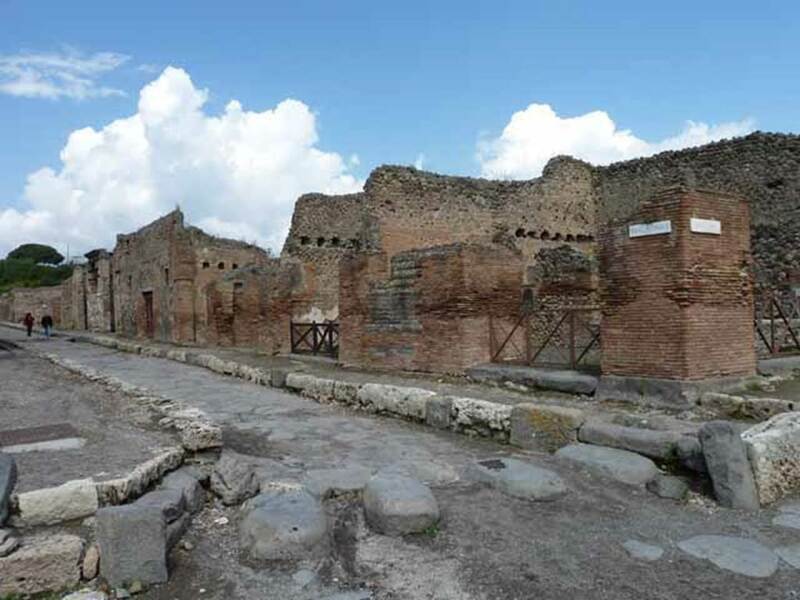 Pompeii. 1964. Looking north from near V.1.30, on right. Photo by Stanley A. Jashemski. Via del Vesuvio. May 2006. East side. Looking north near V.1.28. 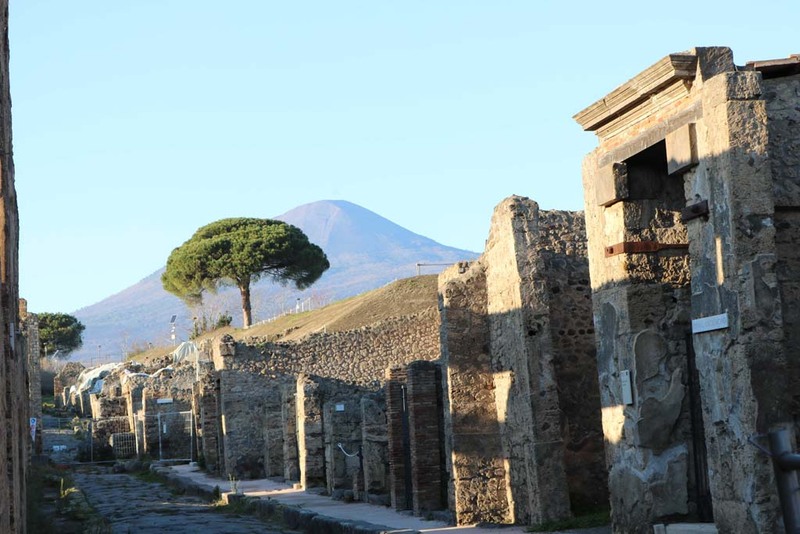 Via del Vesuvio. 1961. Looking north along the east side, from V.1.28. Photo by Stanley A. Jashemski. 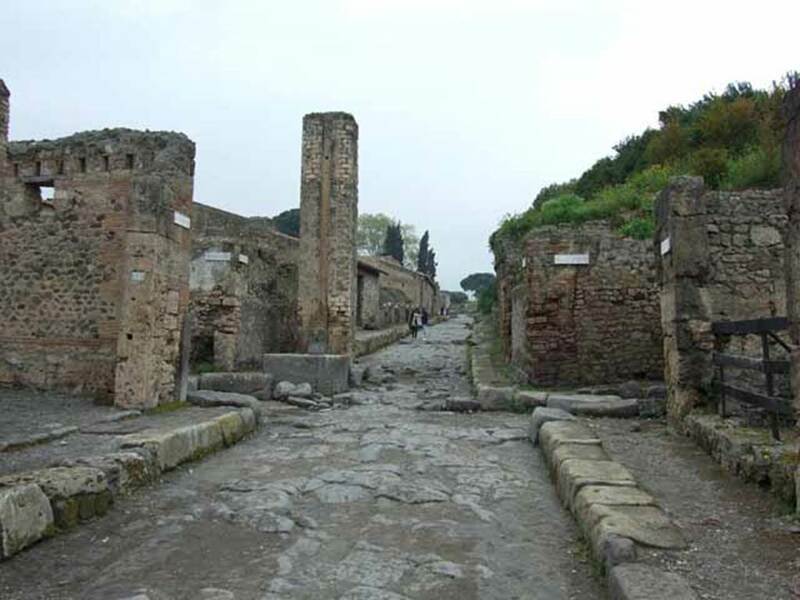 Via del Vesuvio. 1956. Looking north along the east side. Photo courtesy of Rick Bauer. 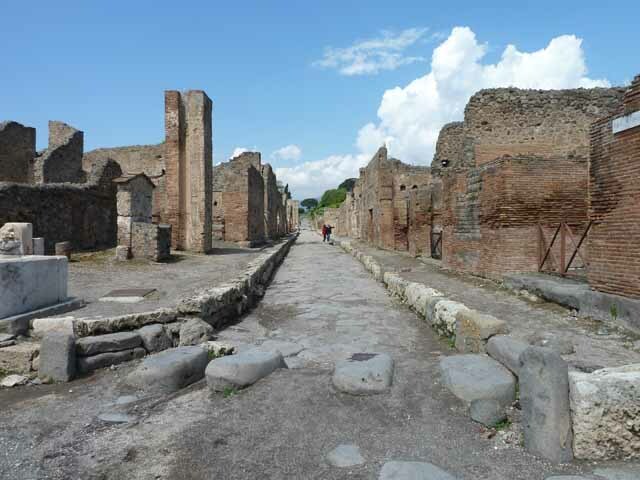 Via del Vesuvio. About 1909. Looking south from VI.14.21 right and V.1.28 left. 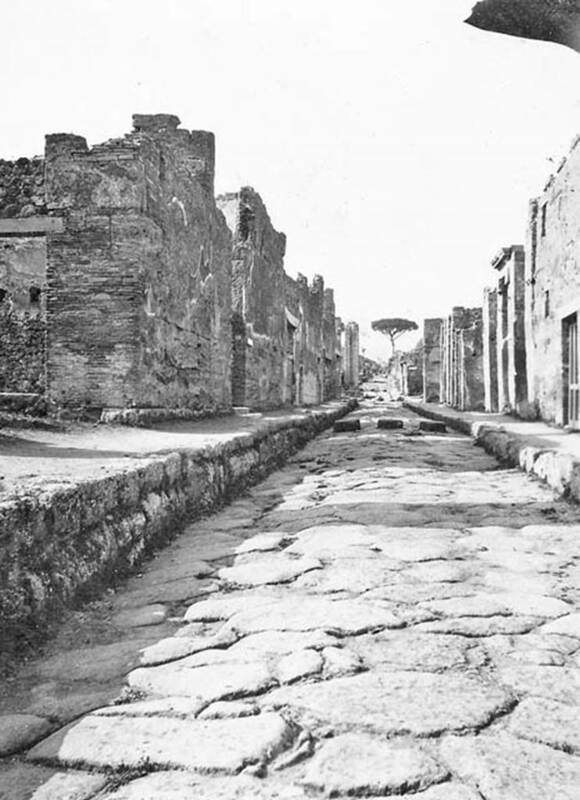 Looking towards junction with Via Stabiana, Via di Nola and Via della Fortuna. Photo courtesy of Rick Bauer. Via del Vesuvio. May 2010. Looking north between VI.14 and V.1. 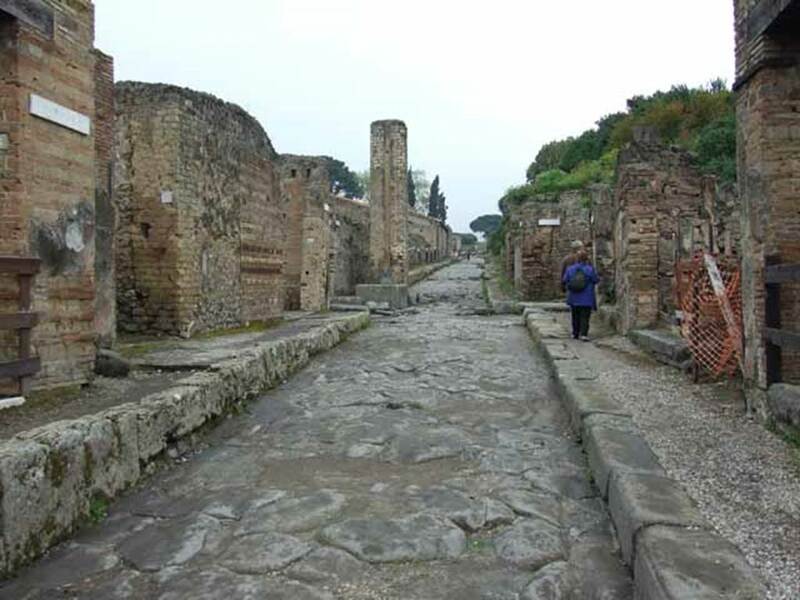 Via del Vesuvio. May 2010. Looking north from between VI.14.28 and V.1.16. 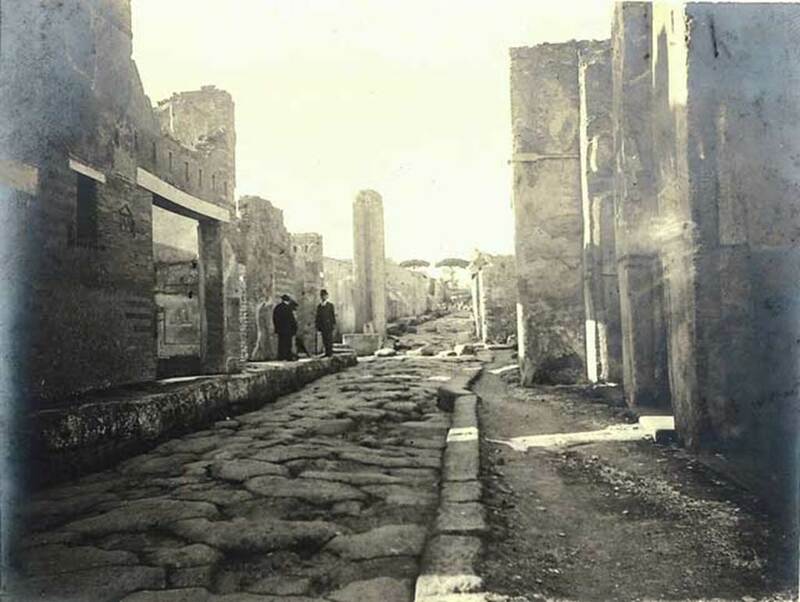 Via del Vesuvio. About 1909. Looking north from near VI.14.28, on left. Photo courtesy of Rick Bauer. 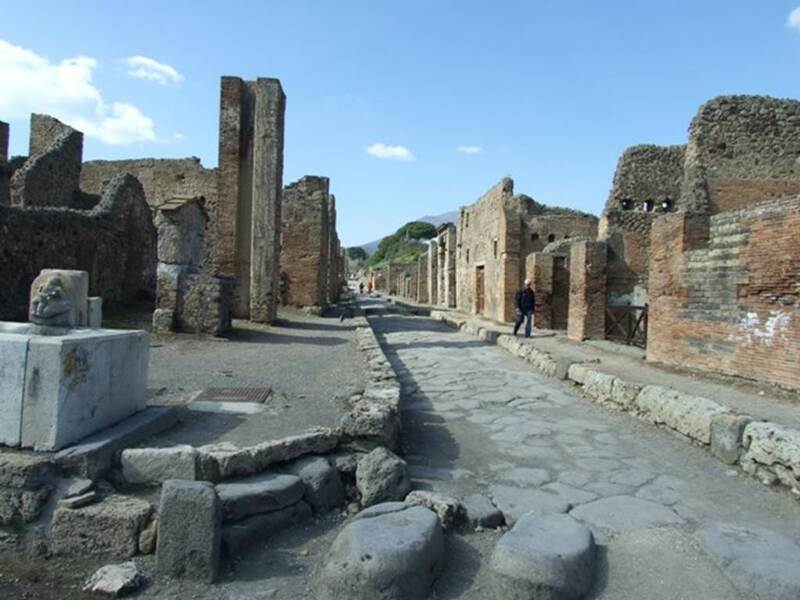 Via del Vesuvio. C.1880s. Looking south. In the lower right is VI.14.28/29/30. The area on the left, V.1, is still being excavated. In the lower left is V.1.14/15/16. Photo courtesy of Rick Bauer. 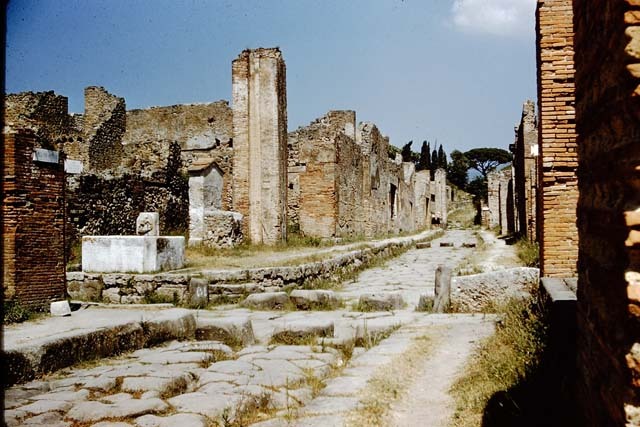 Via del Vesuvio. May 2010. Looking north towards the junction with Vicolo di Mercurio and Vicolo delle Nozze d’Argento. 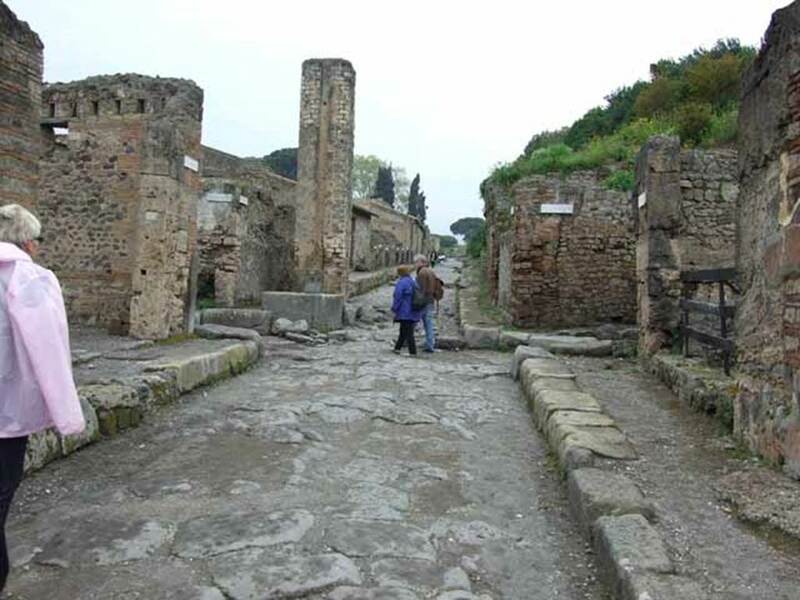 Via del Vesuvio. May 2010. 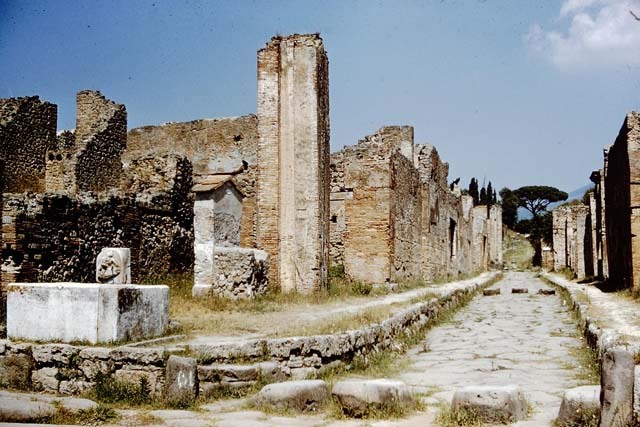 Looking north towards the junction at the north-east corner of VI.14, in the middle of the Via. 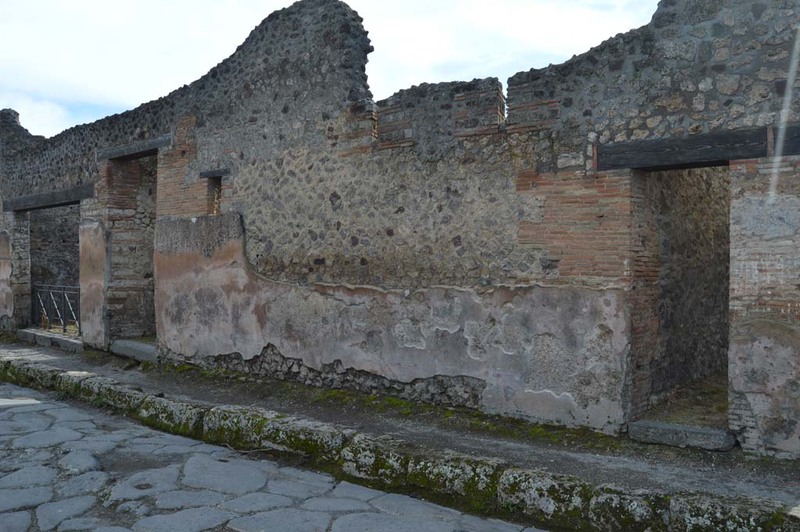 Pompeii, September 2015. On display as an exhibit in the Summer 2015 exhibition in the amphitheatre. Plaster cast of a victim numbered 9, found 23rd April 1875. 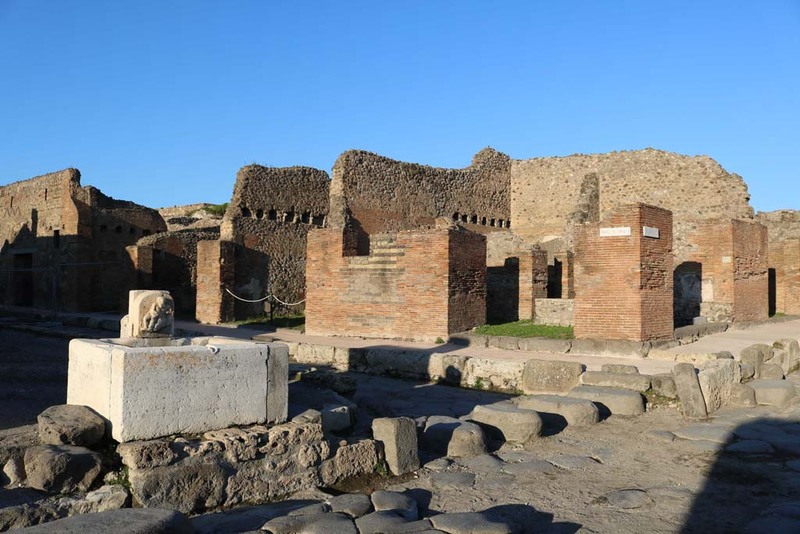 This fugitive was found in the middle of the Via del Vesuvio (Via Stabiana) at about a height of four metres from the ancient street level, near the north-eastern corner of Reg. VI.14, together with victim numbered 10. Pompeii, plaster cast of a victim numbered 9 in museum case. Found 23rd April 1875, the iron bar at the side of him was also found. 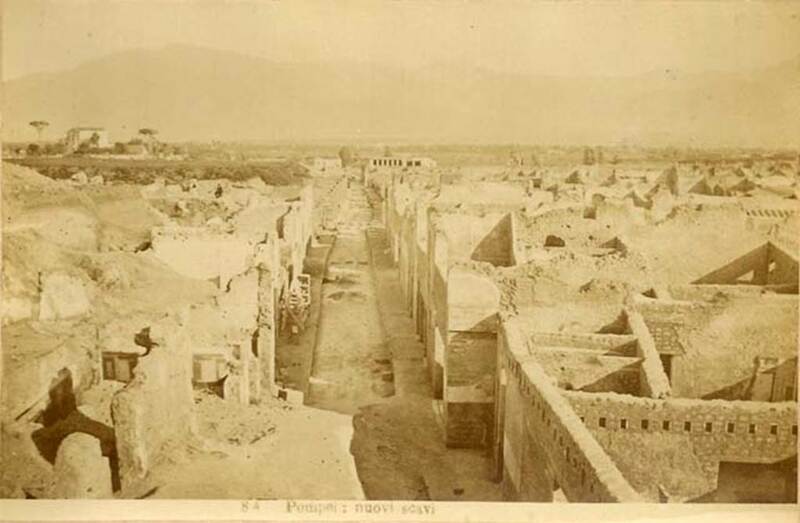 Photograph by Sommer, c.1879. Photo courtesy of Rick Bauer. 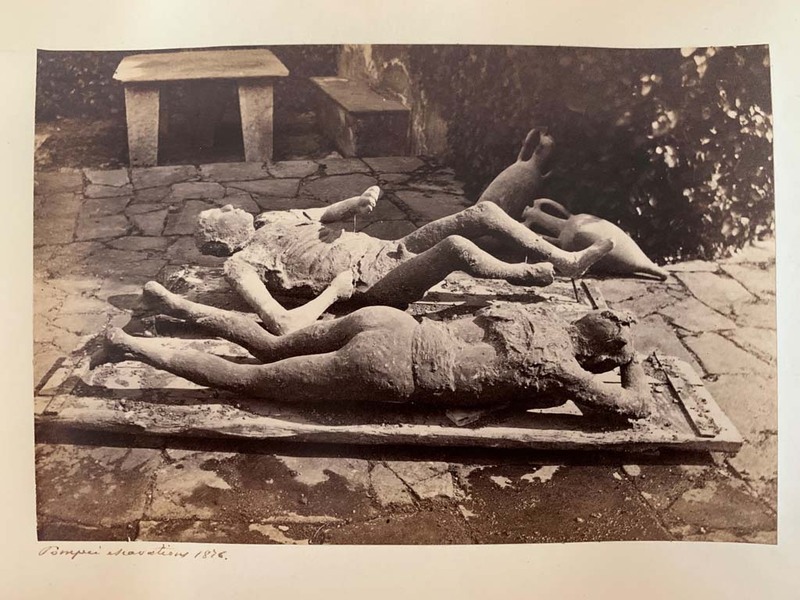 Pompeii, plaster casts of victims 9 and 10 found 23rd April 1875. Undated photograph by Mauri numbered 023. Photo courtesy of Rick Bauer. Pompeii, plaster cast of a victim numbered 10, found 23rd April 1875. Undated photograph by Rive numbered 168. Photo courtesy of Rick Bauer. Plaster cast of a victim numbered 10, found 23rd April 1875. 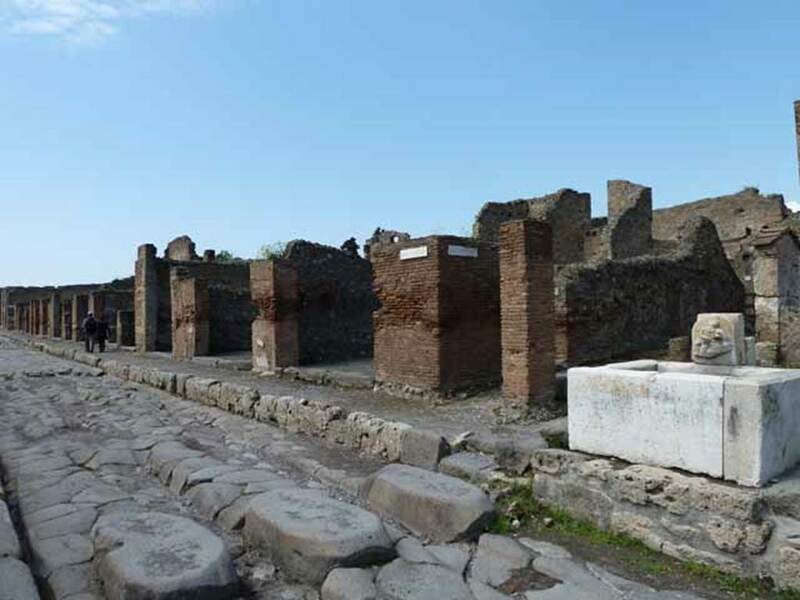 This fugitive was found in the middle of the Via del Vesuvio (Via Stabiana) at about a height of four metres from the ancient street level. near the north-eastern corner of Reg. VI.14, together with victim numbered 9. Cast of a woman with her tunic raised over her head. Found 23rd April 1875 in NE corner of VI.14 in middle of Via del Vesuvio (Via Stabiana) at height of 4m above ground. See Garcia y Garcia, L., 2006. 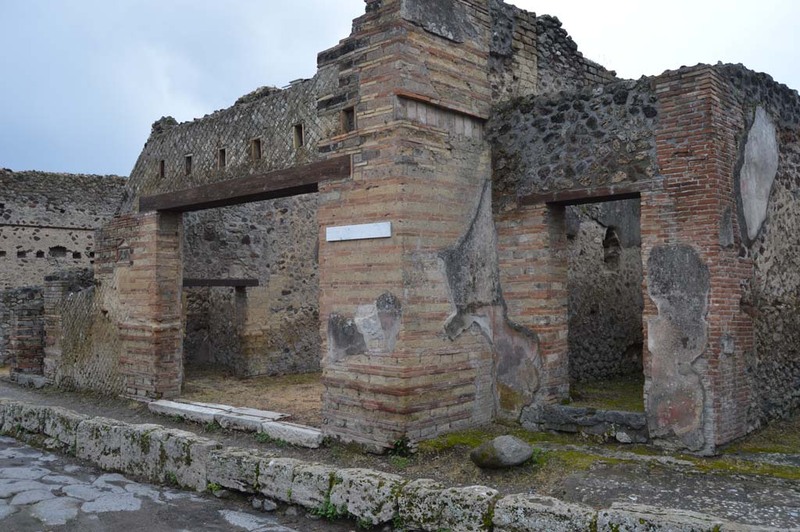 Danni di guerra a Pompei. 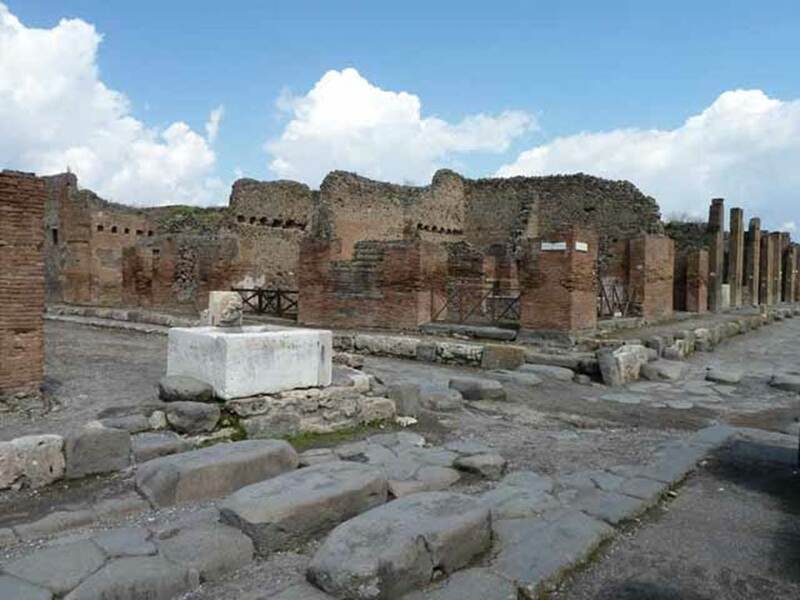 Rome: L’Erma di Bretschneider. (p.192, Figs 445-7). 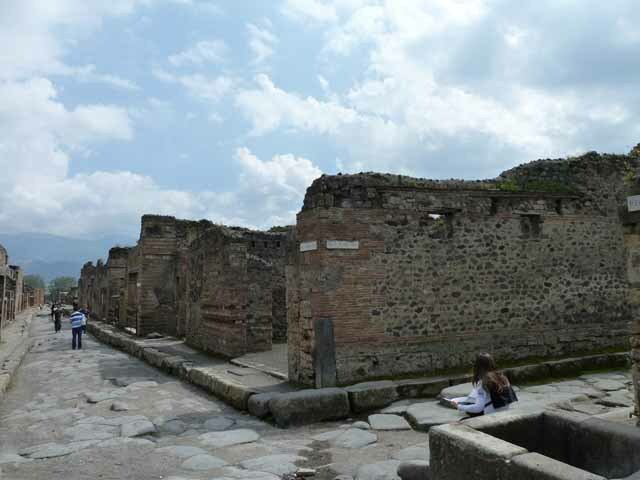 See Giornale degli Scavi di Pompei, N.S. 3, 1877, Column 173, n.23. 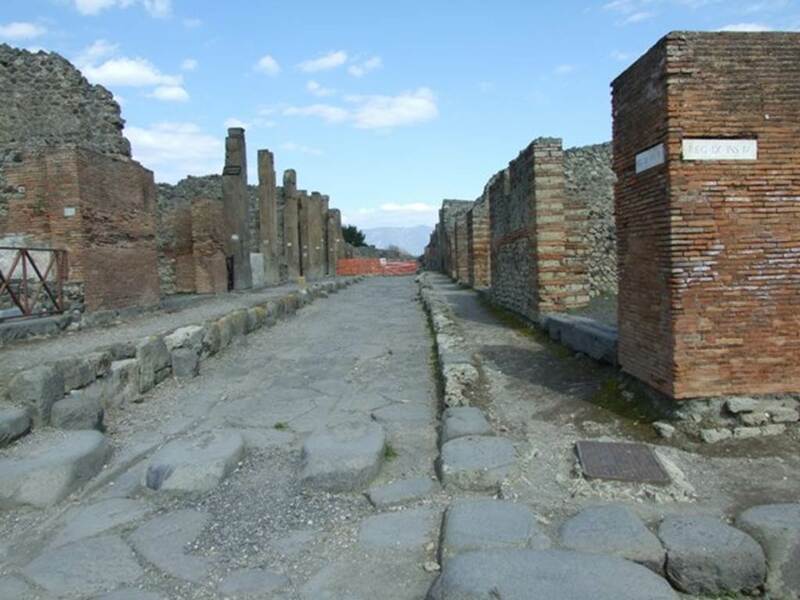 Via del Vesuvio. May 2010. Looking north past the junction, between VI.16 and V.6.